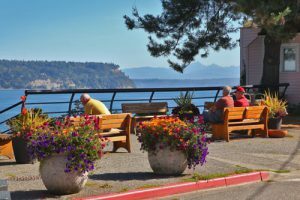 Overlooking Saratoga Passage and the Cascade Mountains, Langley is home to a charming historic downtown, unique stores, lodgings, great restaurants and some of the most interesting people you’ll ever meet – and the Langley Main Street Association is here to support all the things that make Langley remarkable. Our Main Streets tell us who we are, and how the past has shaped us. Langley is no different. Downtown is the place of shared memory where people still come together. Main Street is a national movement that has spanned three decades and taken root in more than 2,000 communities – a movement that has spurred $49 billion in reinvestment in traditional commercial districts, galvanized thousands of volunteers, and changed the way governments, planners, and developers view preservation. The Langley Main Street Association is a non-profit organization that focuses on economic revitalization and historic preservation in Langley, WA. Formed in 2010, LMSA has supported projects such as the Second Street Market in Langley during the summer months, shuttle rides from event sites into downtown, decoration and beautification projects and events during the slower seasons. Langley Main Street Association became a designated non-profit organization by WA State in June, 2012. Its purpose is to preserve and sustain the small historic downtown character of Langley. As a non profit, LMSA is committed to historic preservation, lessening the burden on city government, collaboration with like minded entities and community education. LMSA is based on the approach of the National Main Street Program and Washington state Main Street Program under the Department of Archeology and Historic Preservation.